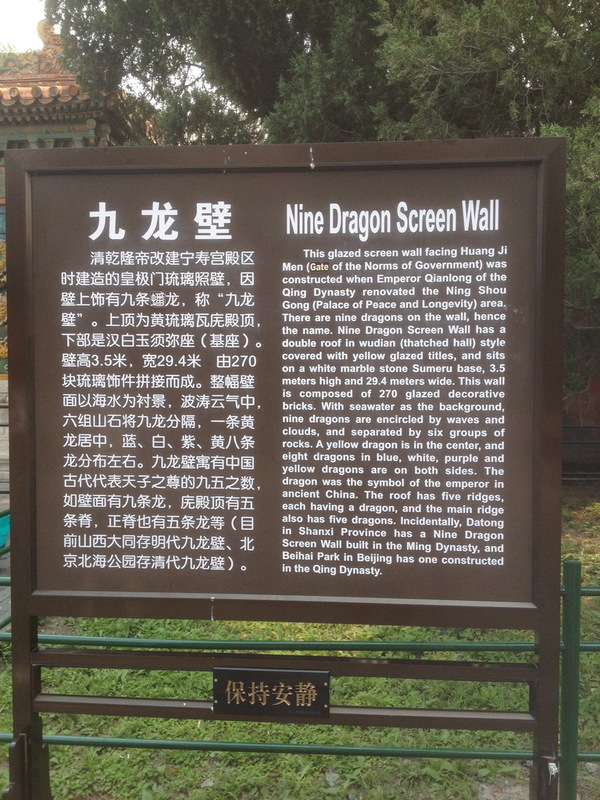 The Nine-Dragons Wall isn't totally unfamiliar to me as I have seen replicas elsewhere around the world. The nearest to the folks in Singapore would be the one located at the Singapore Chinese Chamber Of Commerce at Hill Street. The other replica that I have seen would be at, believe it or not, North Carolina, USA. 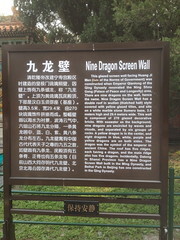 There was a write-up about the wall which you can click the picture on the right to get a bigger enlargement. So there I was taking my time to go up close and study each of the nine dragons and this one particular has something peculiar about it. 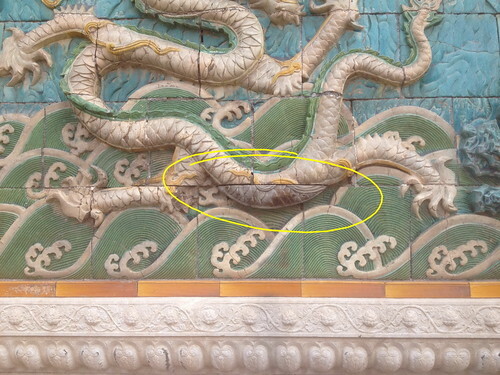 It is the third dragon counting from the left. A white dragon. The bottom section of this particular dragon's body didn't quite fit in with the rest of the body. 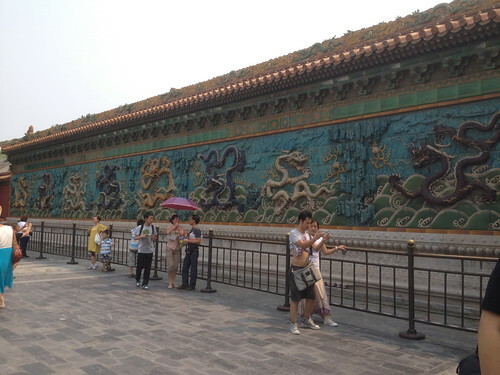 It doesn't have the sheen as expected of a glazed tile, granted that the tiles have all been weathered for centuries. A closer look and I realised that it is probably made of wood rather than glazed tile that it was originally meant to be. I can seen the grain of the wood and wait. Is that nails I see embedded inside? What I learned was that legend has it that during the construction of this wall, this particular piece of tile was accidentally broken by one of the masons. A replacement tile would have been impossible as every piece of tile is unique like in a jigsaw puzzle. Remaking the tile would take too long, if it were possible in the first place. Bear in mind, it was an era where people were put to death for the slightest reason. Just think how many people died while constructing the Great Wall. How would this be any different? 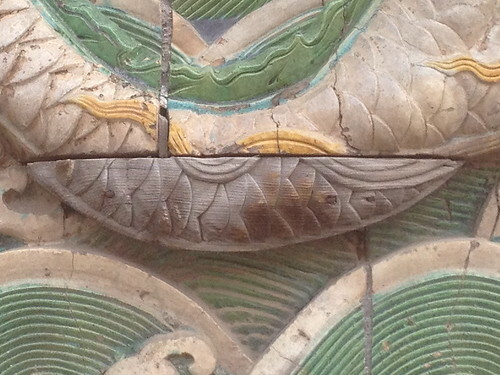 So it was speculated that in the masons' attempt to cover up this catastrophe, they replicated the tile in wood. With the same glazed paint, no one would be able to spot the difference when it was relatively new. Alas, different materials deteriorated differently under years', decades', centuries' worth of sun, rain, snow and sleet that the hush-up finally surfaced.